The Legislature is back in session, which means more “gut-and-replace” tactics. Here’s an inside look at how bills suddenly, and completely, change. Of all the practices at the Hawaii Legislature, none evokes more controversy and intrigue than “gut and replace,” the process of swapping out the text of a bill to turn it into completely different legislation. Gut and replace can range from relatively benign, where a legislator’s novel idea simply gets replaced with something pragmatic that needs to pass quickly, to malicious, where a bill is repurposed to stop certain legislators from having their way, or even to undermine a political movement. My first experience with gut and replace was in 2006 as a clerk for the House Human Services Committee. New employees typically get a Civics 101-type refresher in the form of a crash-course orientation session, often capped off with a viewing of “I’m Just A Bill On Capitol Hill” from the “Schoolhouse Rock” cartoon. In learning the A to Z of the Legislature, the “G” of gut and replace is usually not brought up. 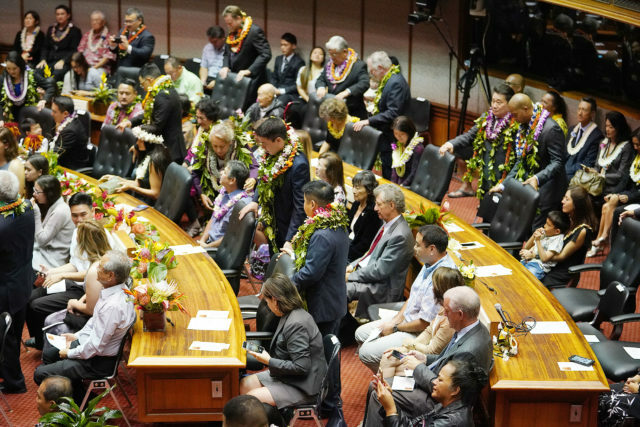 House members bedecked in lei on Opening Day last week. Another session of wheeling and dealing has begun. In mid-session that year, it was discovered that my committee had no bill introductions addressing a certain topic that had arisen. Chatting with a House Majority Staff Office analyst whose name I can’t recall, I lamented that there was nothing we could do. “So … hijack the taxi cab? Bill hijacking?” I asked, envisioning a hostile takeover. “I’ll talk to my boss,” I said, gathering up my hearing folder and notes. When I discussed the idea with the committee chair, then-Rep. Alex Sonson, I got permission to proceed, and went about looking for a bill to repurpose. I ended up being an accomplice to several bill hijackings. At Human Services, I was empowered to read all bills in advance, then make a spreadsheet matrix that proposed potential actions to the chair on all measures in our referral (defer, amend, hijack, etc). G&R is not as easy as some suggest. First of all, a bill had to have a kind of Goldilocks zone where the original title was neither too generic nor too specific. If a bill had too many committee referrals, it was not a good candidate for hijacking. As a professional courtesy, I first looked at bills we’d introduced ourselves that were in my committee. That didn’t always work, so then I looked at carryovers from last session that had been deferred in previous hearings. When that failed, I looked for measures that had identical Senate companions that were moving faster, so that people wouldn’t mind if the slower clone was gutted and replaced. Most chairs today usually employ “proposed draft” hearings rather than outright hijackings, where a hearing notice is issued that informs the public of a committee’s intention is to vote on two versions of a bill already heard once, and members have a choice of passing the original bill, or choosing an amended House Draft (HD) or Senate Draft (SD). But sometimes bills just get gutted and replaced outright. Because decision-making hearings are poorly attended by the public and minority Republicans usually show up in the nick of time to vote, G&Rs are rarely resisted in committee. The deterring check on G&R usually comes in the form of a floor debate during second or third/final reading, but most legislators save their breath for only the most disagreeable bills. The House Finance and the Senate Ways and Means committees also serve as “correction committees” where bills that have gone astray can be reverted to their original draft, but this doesn’t usually happen unless the legislation is important to leadership. I believe G&R is unnecessary, but there are a couple of reasons why it happens. First, unlike Senate counterparts, House members are usually capped at the number of bills they can introduce (subject to waivers from the speaker). As a result, there aren’t always enough vehicles to accommodate every idea a member has, and if something unforeseen comes up in the middle of session, there are limited options. Many bills are also drafted with extremely generic titles – “Relating to Public Safety,” “Relating to the Environment,” “Relating to Public Schools” – making them vanilla to survive multiple revisions in committee, but also leaving them prone to hijacking. Another reason why G&R happens is because the three-month legislative process is torturous, and numerous committee referrals increase the chances that a bill can mutate into a monster by the time both chambers have had their way. Members easily get into an amendment arms race to see who can force their way through the process. While a lawsuit to stop G&R is ongoing, there are interim ways to deter or stop the process altogether. One might be a self-imposed practice of writing bills with more specific titles to make them hijack-resistant. Legislators could also, as a last resort, request floor amendments when sweeping changes are needed in a bill, as it would at least shift the political responsibility of gutting a bill to a larger body, making it less egregious to democracy. Ultimately, however, the best check against G&R is simply an engaged and active public willing to testify at hearings. 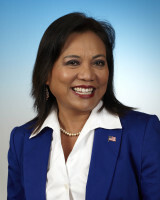 Democrat House Rep. Rida Cabanilla, who returned this year to replace outgoing Rep. Matt LoPresti in representing Ewa, says that G&R unfairly alters the process against both elected members and the public. 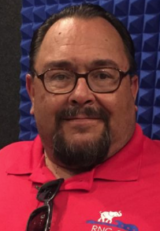 Brett Kulbis, chair of the Honolulu County Republican Party, says that he and his members will take an active role in monitoring the Legislature and ensuring the public is “awakened” to hold committees responsible. G&R, like many other legislative practices, disenfranchises the public and perpetuates cynicism that the system is rigged. Sometimes, the most courageous or righteous act is not what we do, but what we don’t do – and it’s time to stop G&R. 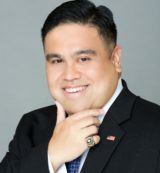 Disclosure: Danny de Gracia was employed by Rep. Rida Cabanilla from 2007 to 2008.